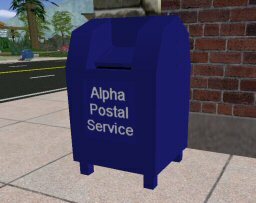 These are the Alpha Postal Service standard blue public mailbox, perfect for sidewalk detailing. Comes with interactive lid. The base object will be the center of the mailbox.